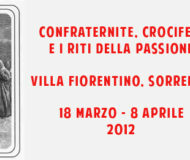 Will be “Confraternite, crociferi e i riti della passione” (Brotherhoods, crucifers and rites of passion) the title of iconographic exhibition will be staged within the prestigious Villa Fiorentino in Sorrento, from Sunday, March 18 to Sunday, April 8. The exhibition will focus on the Holy Week rites and traditions that are handed down for centuries in the population. The exhibition will be curated by one of the greatest researchers of the traditions of the Mediterranean sea: Massimo Fiorentino. The retrospective will accompany guests to discover the rituals that characterize this particular time of year, through photographic evidence, to be analyzed, being able to to transport you in the middle of the traditional aspects of Sorrento, as well the entire Mediterranean. Description: From Sunday, March 18 to Sunday, April 8, the exhibition will focus on the Holy Week Sorrento rites and traditions.